This is part 2 in a two-part series. Part 1 can be viewed here. “Foot stabs” like this require good core strength to maneuver the extended foot into place, and to keep the hips tight to the wall so that pressure can be maintained on the extended foot. 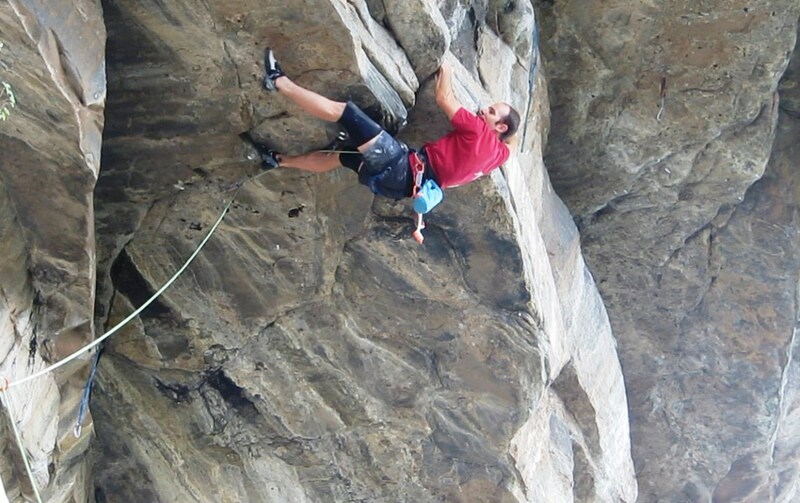 After returning from Germany I was physically spent from such a high volume of climbing, and nursing a mild shoulder impingement, so I took the opportunity to practice my roof-climbing at the local gym. 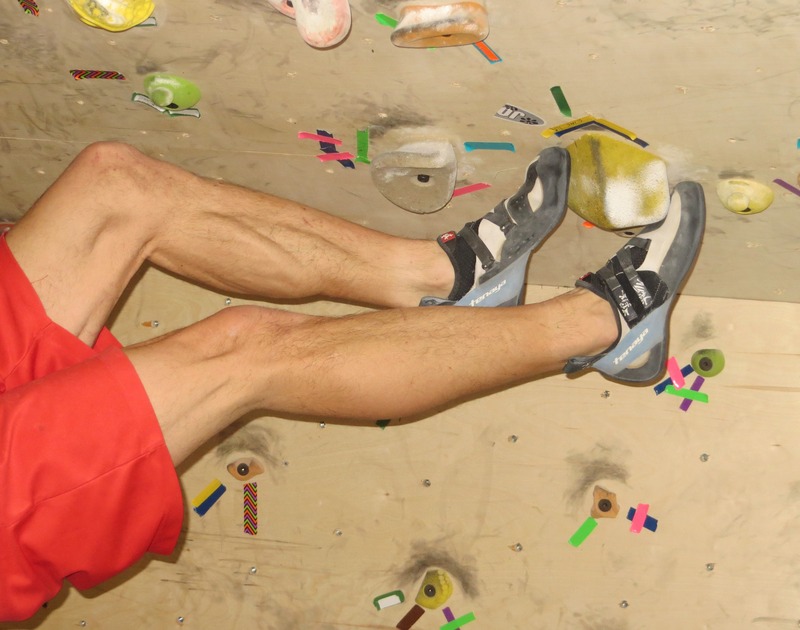 With a pound or 15 of croissant-fueled ballast, I worked my way through the many roof problems, practicing skills like toe-cams, heel hooks, and the aforementioned bicycle. In mid-winter I took my new strength and skill to the streets, nabbing another Clear Creek prize along the way, the roof-centric open project Double Stout. This litmus test re-assured me that I was on the right track. As the winter snows began to ebb, I redoubled my focus. Spare moments were spent analyzing video from my recon bids, imagining potential sequences around the blank sections, and convincing myself that I would be good enough to execute them, but there was only one way to know for sure. Practicing roof climbing on Double Stout. Photo Mike Anderson. In late April the Bunker was finally good to go, so I headed up with Kate to give it a shot. There were at least two moves in the first roof I couldn’t do last year, so I would know right away if I’d made any progress. The fingertip rail in the first roof was damp and seeping during my first foray, and I was unable to do a difficult crossing move on the rail. 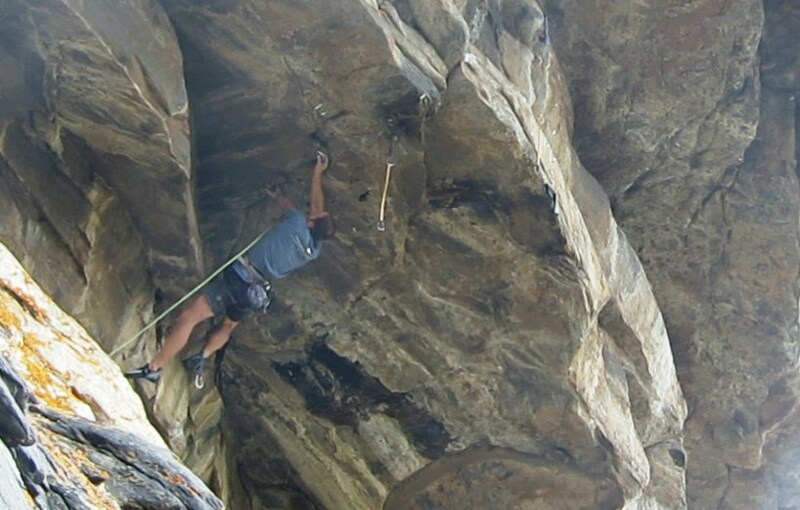 The move seemed plausible, but I kept slipping off the wet rock, so I moved on to the next trouble spot—a big dyno out to jugs on the lip of the low roof. I stuck the slap on my first try, and it felt easy. So far so good. The tenuous cross move in the first roof. With one down and several more stumper moves to go, I proceeded quickly to the final visor. I was pretty much entirely unable to climb the visor last year. I mimed some moves with Mike taking 50-80% of my weight at the belay, so I had a sense that they could go, but I was miles from doing them at that time. The visor crux begins with a long span to a jug rail a few feet out from the crook of the roof. From this rail you can reach out into a crack system that cuts diagonally through the nearest half of the roof. This crack pinches down in one place to create a pretty nice—albeit wickedly sharp—two-finger pocket, and flares open to offer a big pod in another spot. The pod curves as it deepens to offer a set of slopers on the “bottom” side (from the climber’s perspective). Beyond the pod, the crack veers off and pinches down to a seam. A couple feet further a big horn of rock protrudes downward (and slightly west), offering a nice pinch grip. As you near the lip a detached flake emerges from the roof, at first providing a 1.5-pad incut edge, and then flaring into full-finger jugs just before the lip. The lip is adorned with a gnarly blob of knob-covered stone that provides a pair of killer jugs and plentiful footholds. An awkward stance in the crook of the visor. Months of film study had convinced me I knew the sequence, so I set out to execute it. Full stop! My plan to grab the pod sloper, toe-cam in the jug rail and then drive-by to the horn was a disaster. I could barely match in the pod, and even then I had no hope of releasing my toe-cam with any sort of control. The next 30 minutes were spent doing what I do best—putzing around on the rope, groping for possibilities. I messed around with the two-finger pocket, various matches in the pod, and other holds further afield. Eventually a new concept emerged: matching hands in the pod, walking my feet around in front of me, and then swinging out to reach the horn. Not easy, but I was able to do all the moves individually. The next bit was at least as hard—linking from the pod/horn to the jug flake. I continued with the same strategy, leading with my feet, and discovered with good core tension I could stab my feet out to the knob garden at the lip. From this position it was barely possible to “unwind” from the pod and slap my left hand to the initial edge in the detached flake. No longer extended, I could get my hips closer to my feet and pull through with my right hand into the good flake jugs. From there it was a formality to swing out to the lip. Stabbing my foot out to the “Knob Garden” at the lip. Note the sage-colored washcloth in the lower left, used to dry a damp hold at the start. By this point it was raining so I didn’t try the mantel onto the wet moss-covered slab. I looked over the lip, spied a few good jugs and declared it NTB—Not too Bad. I was elated with my progress but still slightly concerned about that first hard move in the opening roof. The next time out the finger tip rail in the first roof was still damp. Realizing this was the key to the entire route, I put in some more effort on this section, and I was eventually able to do the move in parts, but each time I tried to link the entire boulder problem my fingers would fling off in one spot or another due to moisture. Eventually I was convinced the sequence would go in dry conditions, so I moved on to practice the visor sequence and suss that NTB mantel I mentioned earlier. As my clever foreshadowing suggests, the mantel wasn’t as easy as it looked. There are two big jugs to work with, one right at the lip, and another about an arm’s-length deep on the slab. The slab itself is about 45-degrees steep, covered in “rock lettuce” (tiny bushes of lettuce-shaped lichen)and offers few appealing footholds. From the jugs, you can throw a left foot over the lip, but due to the angling nature of the visor, that foot is well above head level. Pressing out the mantel begins easily, but then you need to move your low hand up to make room for your hips and the dangling right foot. 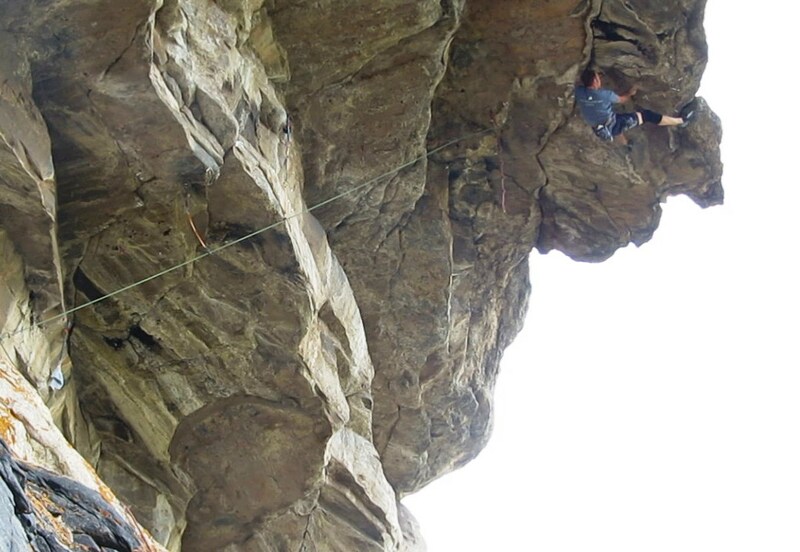 But there are no more holds, only a plethora of moss-covered bumps, and one finger-tip-wide horizontal crack. Throwing my left toe up onto the lip in an attempt to mantel onto the slab. I could make an argument for ending the route at the jugs at the lip of the roof. 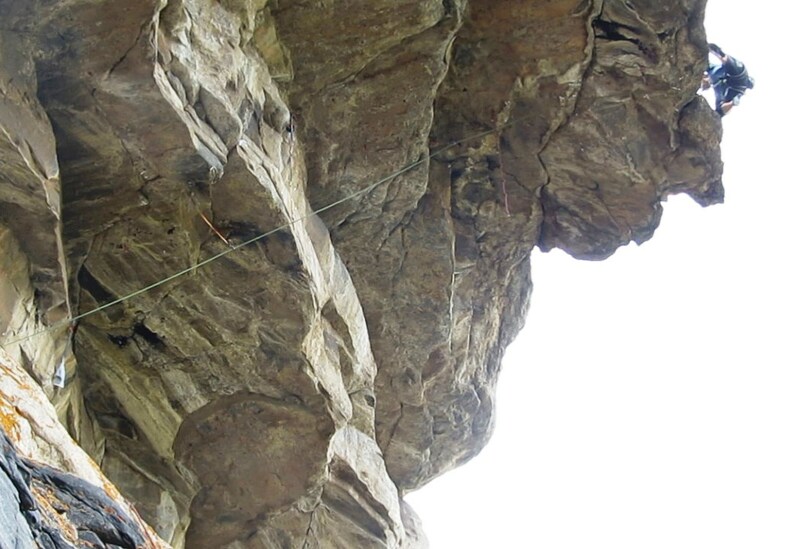 Sport climbing is an entirely arbitrary construct, and many routes end in the middle of a blank wall, where the holds run out, where the rope ends, or where the climbing stops being enjoyable. It’s the route developer’s decision, there’s no peer review or sanctioning body to appease. However, I really wanted to top this thing out. Since the moment I first considered it might be possible to climb, I wanted it to go to the top. The entire appeal of the line to me was the improbability of it. A magical accident of fate that provides just enough holds to transform something that logic and statistics would deem totally implausible into something that is just barely possible. Think of the odds! That the roof could exist in the first place, defying gravity for millennia; that I would find it, untouched and waiting to be climbed; that the rock was solid enough to support my weight, let alone its own. And finally the odds that there are just the right combination of completely natural features, the right size and shape, to permit an unbroken chain of free moves! Stopping at an arbitrary point would destroy this miracle of intertwined geology and organics. It would negate the entire endeavor…. 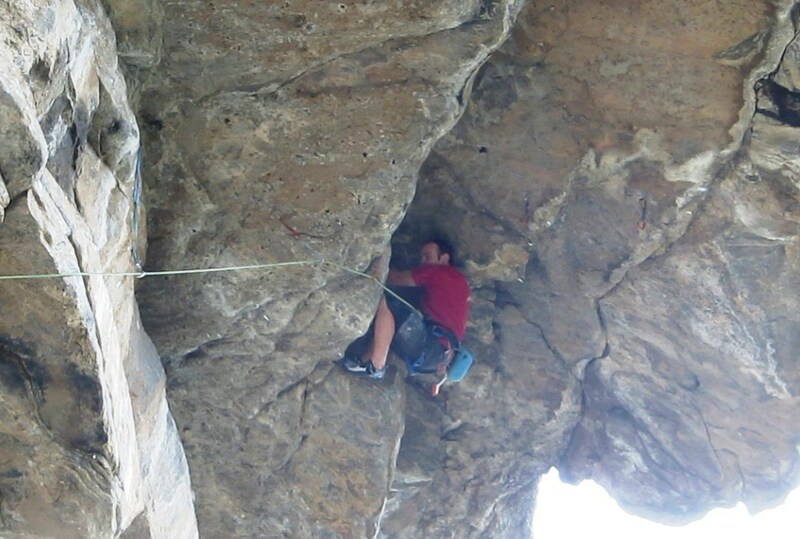 A few more burns over the next week allowed me to dial in the sequences and become comfortable with the runouts. I still hadn’t “sent” the opening roof, but I hadn’t tried it while dry either. The weather was steadily improving, and I figured with a bit of luck, I only needed to scratch and claw my way through that roof once. Finally we arrived on the dry, cool Sunday morning of May 3rd. The very first left hand crimp was wet, not a great omen, but I had fixed a wash cloth to dry it mid-move. I reached out to the finger tip rail—it seemed dry. I went through my sequence, working out to the lip and slapping for the flat mini-ledge at the lip. My left foot popped off as I hit the jug, but I was able to control my swing and reel myself back on. The next section was totally trivial by now, and I quickly climbed to a great rest below the visor. I hadn’t done any Power Endurance training this season—other than working this route—but I figured if I took my time at this rest, and sprinted through the cruxes, I might have enough fitness to make it through. After a long, steady recovery, I was ready. I monkeyed out the relatively brief middle roof, clipped out to the second bolt in the visor, chalked up one last time, and punched out towards daylight. Everything unfurled as I had envisioned. I committed to the slaps, hit every hold just right, and kept my core tight throughout. Before I knew it I matched on the jug flake and reached up to a big knob over the lip. Tactically I was unsure whether to sprint or rest, so I compromised. After a few quick shakes, a dab into the chalk bag, and a moment of visualization, I went for the mantel. Shaking out at the lip, contemplating the mantel. I threw my left foot up onto a sloping edge, craned my head over the lip, and stabbed my left hand into a fingerlock in the crack. 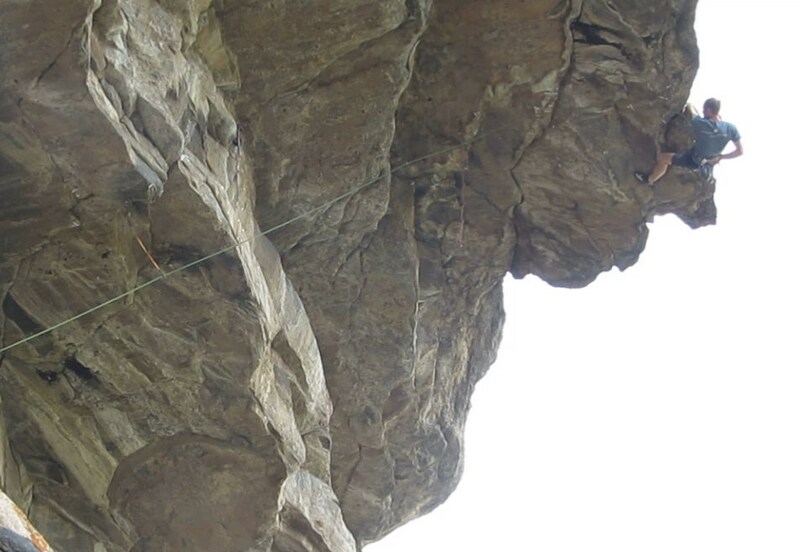 I had considered this beta when I first attempted the mantel, but feared a foot slip would result in me hurtling toward the end of the rope, two or three fingers lighter than when I had started. I like my fingers where they are, but I ultimately exhausted any other possibilities and committed to the fingerlock sequence. With a very carefully placed left toe, and fingers wedged firmly, I was able to squirm upwards just enough to scum my kneecap over the lip. Precariously poised, I moved my right hand into a press and stepped up onto the floating slab. Pressing up onto the slab…Success! Born on the 4th of July is not the hardest first ascent I’ve done, but it’s my proudest. I don’t ever want to leave something unfinished, and so I’m generally fairly conservative when deciding whether or not to equip a potential line. 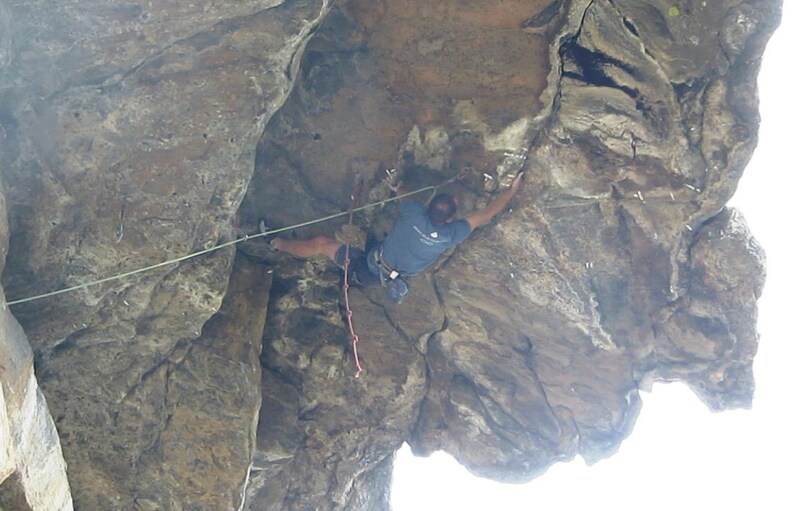 Considering my relative lack of skill with this type of climbing, it took a real leap of faith to rappel over the edge and fire up my drill. 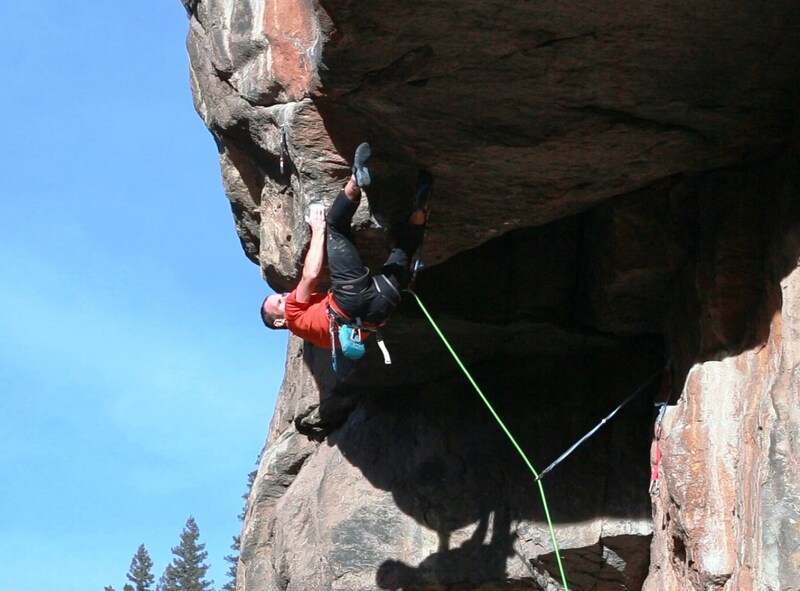 It felt like a tremendous gamble, and I’m proud of myself for having the nerve to commit to learning a new style, building new strength and putting in the days on the rock to unlock the sequence. Making the gamble pay off was extremely rewarding, and I’m sure it will give me the confidence to take more chances on new lines in the future. 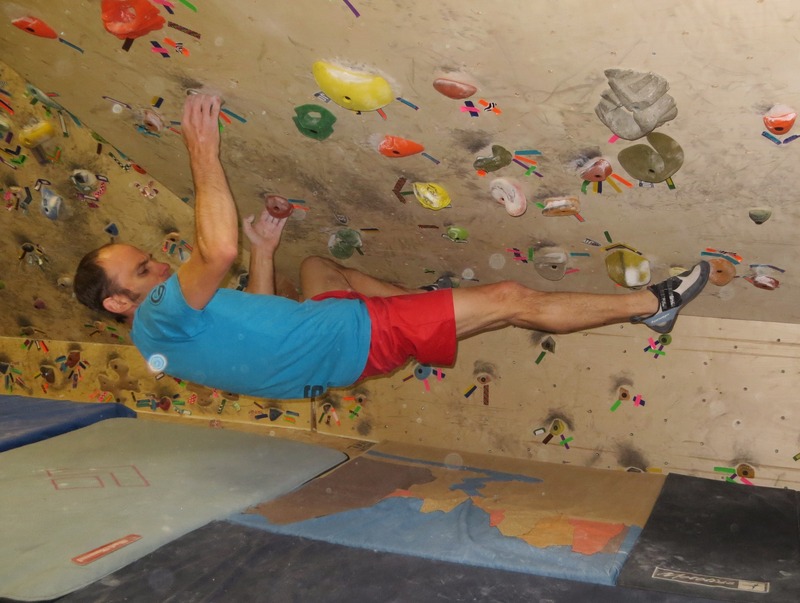 Regardless of the supplemental exercises that I do during my Strength Phase, I find it difficult to transition to Power (which usually includes some steep bouldering) because my core seems weak and the overall flow of climbing movement feels rusty. Is there any way to remedy this problem or is it the small tradeoff for the benefits of periodized training? Its normal for your skill to feel a bit rusty. In my experience (and many others seem to agree), it will come back after a few workouts. If you core feels week, I would recommend including a few more climbing-specific core exercises to your SE routine. Tune in next week for some examples. So….8c? Congrats on the FA!